No I have not joined a dating service for backpackers and hill walkers attracted to men with Scottish sounding names. After staying at home over last weekends Bank holiday I am going to take advantage of five whole days off in a row this coming weekend. 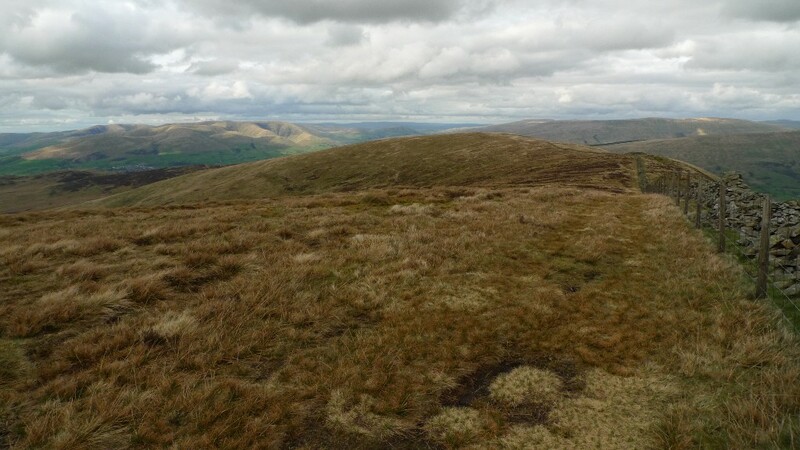 I thought that it would be good to get reacquainted with the hills just north of the Border, somewhere to hopefully escape the Bank holiday crowds. I have to admit to being a bit of a fan of hill lists and will take the opportunity to visit a few new hills and visit some favourites. The blog title refers to some of my nerdy lists. It will be my last outing before the impending TGO challenge, a chance to stretch my legs and make sure that I am happy with the gear that I plan to take. The only thing that I am unsure about gear wise on the challenge is footwear. I have decided that my Adidas Terrex will not be coming as they made my heel sore on the recent trip to the Yorkshire Dales. 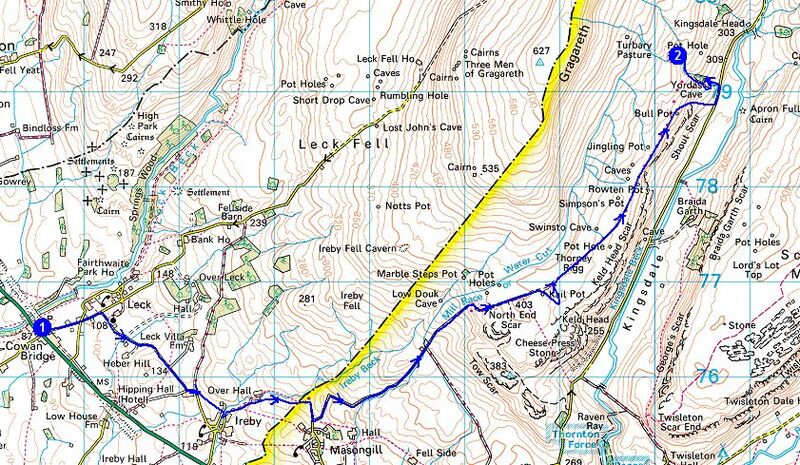 This weekend I am going to see how I get on with my pair of Inov-8 Flyroc 310’s over 4 days on pathless terrain. If they do well they will be my footwear of choice for the two week crossing. If not I will be taking my old, battered but very comfy pair of Salomon Fastpackers on the challenge. They leak like a sieve and take an age to dry once wet but they have never caused a blister or aching feet. 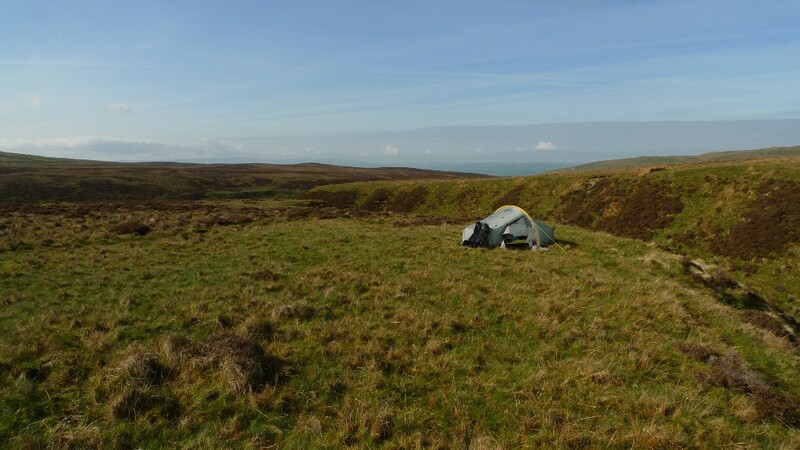 The weather forecast at the moment is showing that it is going to be sunny in Southern Scotland this weekend but potentially very windy, especially on the summits. This is a shame because I had planned some high level camps, however it should be easy to drop down into remote valleys to pitch. Lets hope that my knee problems don’t return once I have a pack on my back and some hills to climb. All going well I should be meeting up with Dougal the chocolate lab and his owners Pete and Fiona on Saturday morning. Sadly my hound Reuben will be left at home as I don’t think I am ready yet to share a tiny tent with him for three nights in a row! Then there is four days of dog food to carry and the stuff that comes out of the other end………. Anyway enough whittering, I need to start packing if I am to leave in the morning. I have to admit to finding it difficult when selecting somewhere to walk in the Peak District these days. I am always hankering after something new and the Peaks have been well trodden by me over the last 15 years or so. It was the day before Good Friday and I had the opportunity for a day in the hills before the hoards descended from every direction. The forecast was to be hot but very hazy, distant views would be lost in the murk. 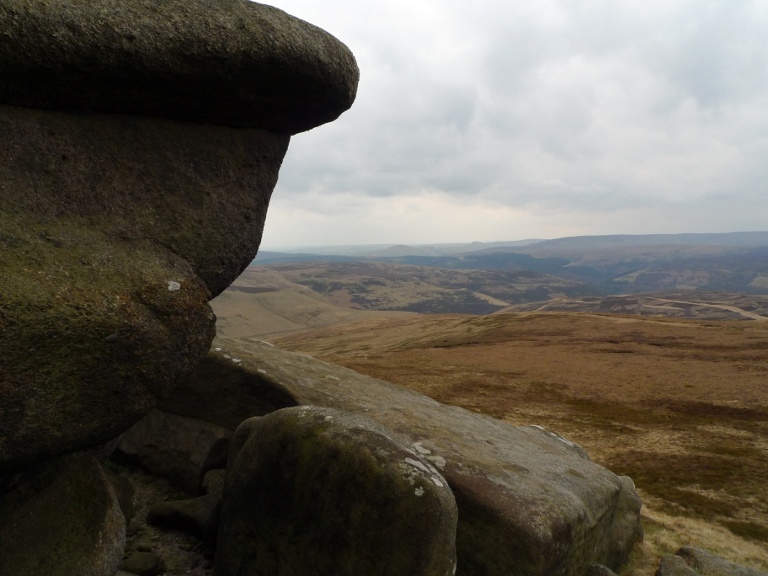 This ruled out the high moors, no point if there is no view. 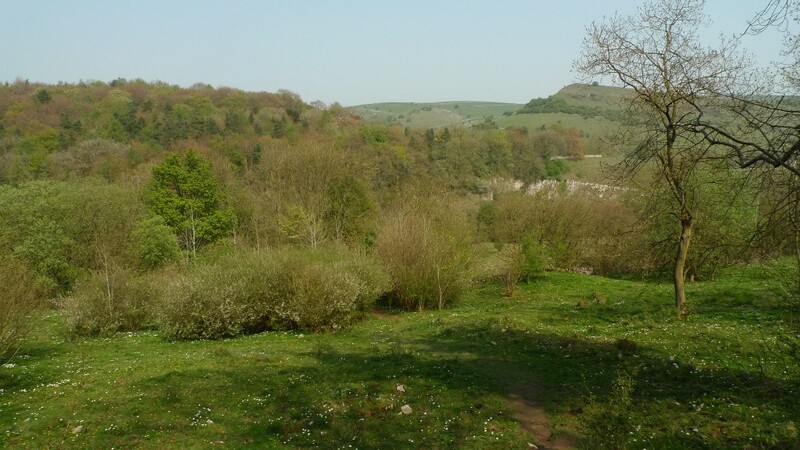 I therefore decided that a more intimate landscape would be ideal, so headed to one of the most spectacular of the Derbyshire Dales, Chee Dale. 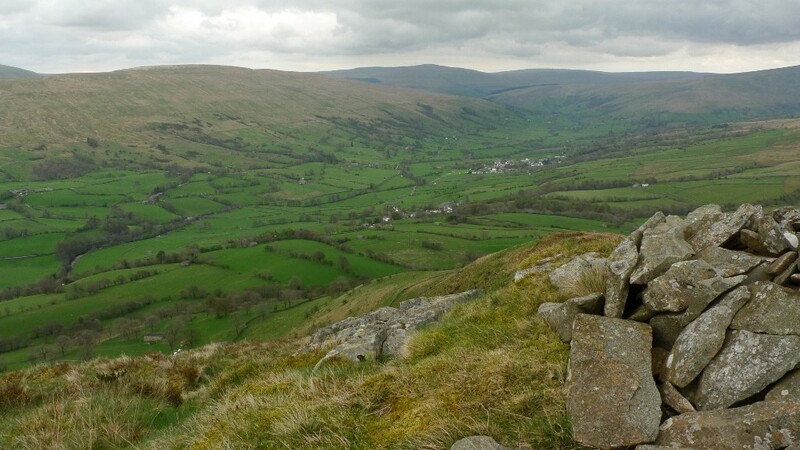 The village of Chelmorton sits high on the White Peak plateau at around the 350 metre contour line. 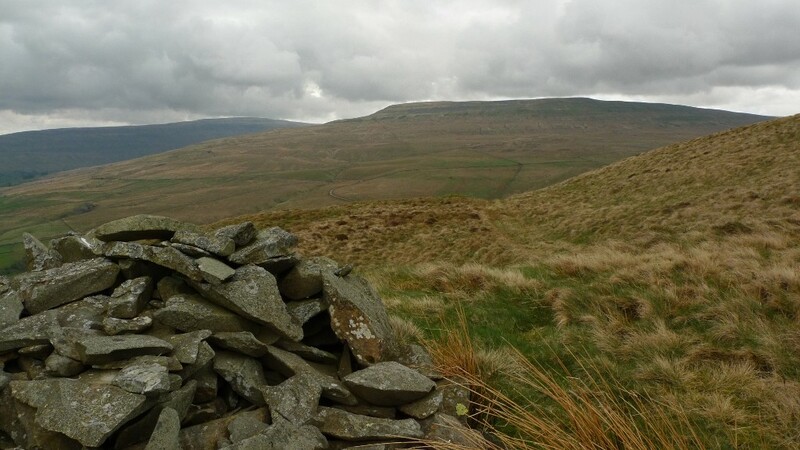 The surrounding countryside is a rolling patchwork of small fields and dry stone walls which does not give an impression that you are that high up. 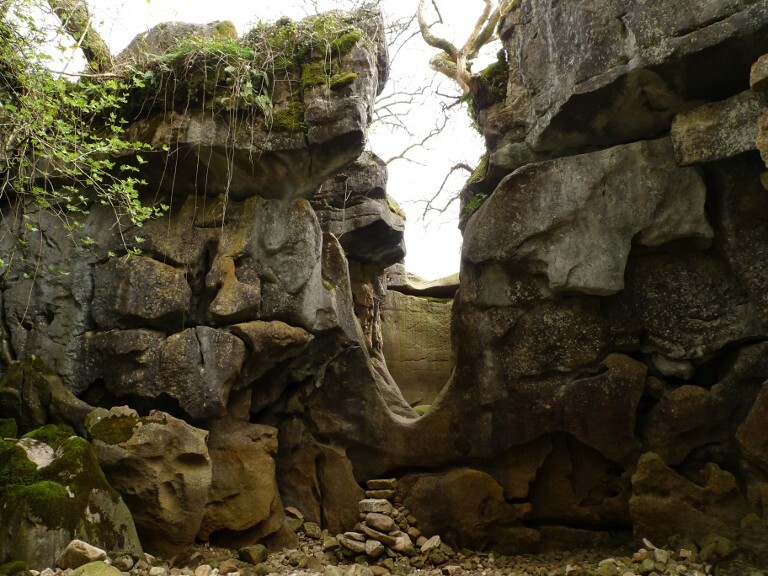 For this you need to get close to where the extensive plateau drops deeply into one of the many Dales. The van was left on the lane outside the church and I set off under the slopes of Chelmorton Low towards Fivewells farm. I find the White Peak to be a dull place for a walk in winter and it is usually very muddy underfoot, I much prefer the moors then. 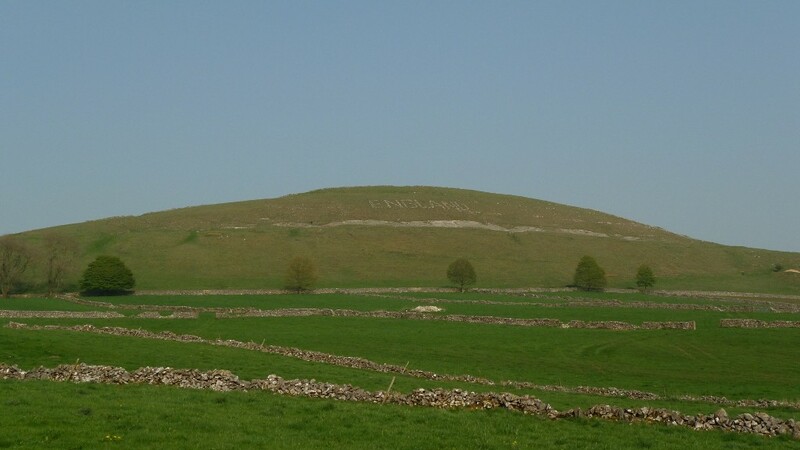 However in the spring and summer the White Peak completely changes character, the dry stone walls dazzle in the sun and the fields and dales are covered in a blanket of flowers. It was great to be walking through dry grassy fields listening to the birds calling and insects buzzing. I was walking for the first time this year in a t-shirt and I enjoyed the warmth of the sun on bare skin. Passing the hamlet of Priestcliffe I played the usual, ‘I would love to have a house here’ game in my head and passed though with a bit of envy. 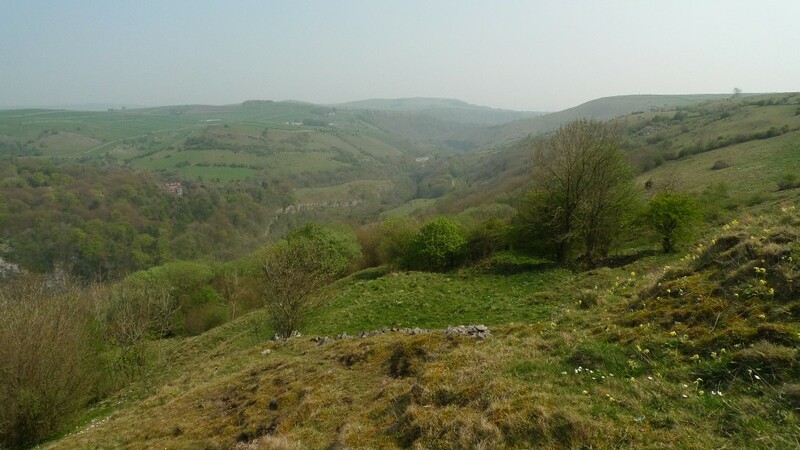 The envy meter went even higher further up the track where the ground tumbles away steeply into Miller’s dale far below. A lovely cottage occupies the edge of the Plateau, a place with a view to die for. I wandered a few metres away and sat on a luxuriant carpet of grass, opening a flask of ice-cold juice and taking in the views. I guy having a rather animated conversation with himself jumped as he came round the corner and found me sitting there. I often wonder if I talk to myself when walking in the hills, he carried on in silence! A path descended though the nature reserve of Priestcliffe Lees leading me down to the disused railway bed, now the Monsal Trail. I now had a decision to make, do I divert and explore the wild Monks Dale adding a few miles to the day, or simply head west. I took the easy route as I was already feeling hot and a bit tired. 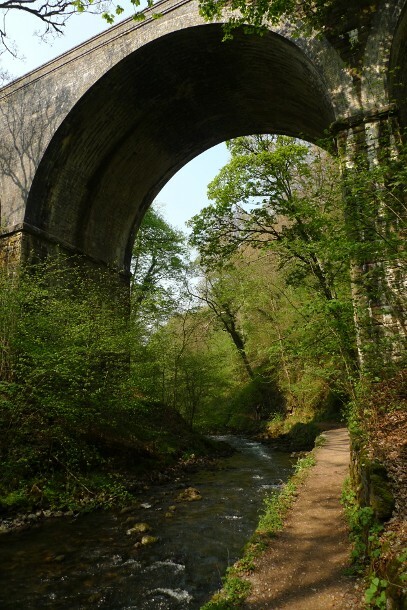 Chee Dale is a stunning place and from the east it gets wilder and more scenic with every step after you have passed under the first viaduct. I have abseiled off one of these viaducts, something well worth doing for the buzz of dangling in space for a minute or too. The hardest thing being stepping off the edge at the top. A couple of guys were fly fishing in what may have been compulsory uniforms of tweed and silly hats, the equivalent of hill walking on a hot day in a morning suit perhaps? 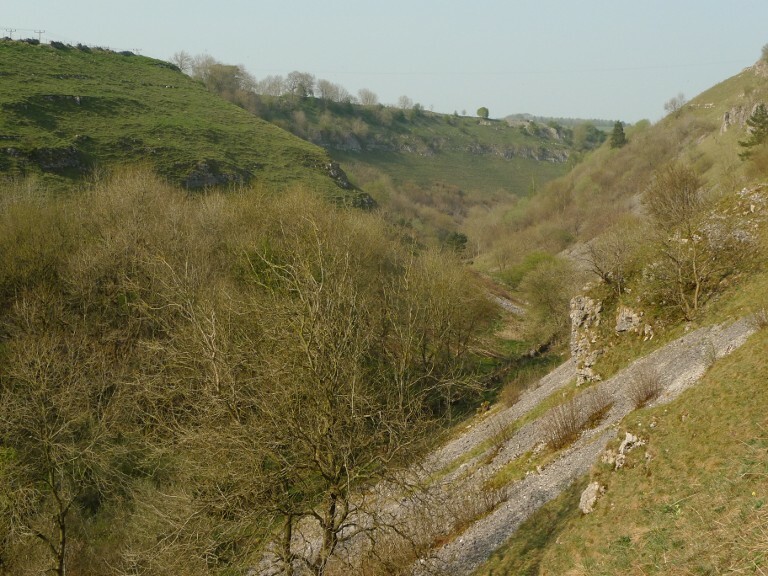 The valley was now closing in, exposed limestone steps polished by many boots over the years. 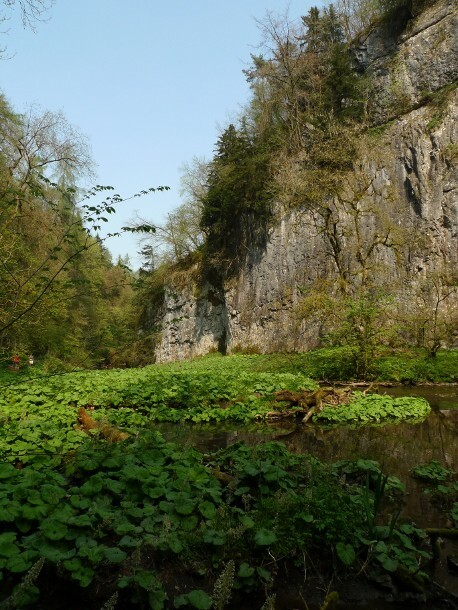 I was soon in a stunning gorge with high limestone cliffs rising sheer out of the water, luxuriant undergrowth just beginning to spring to life. 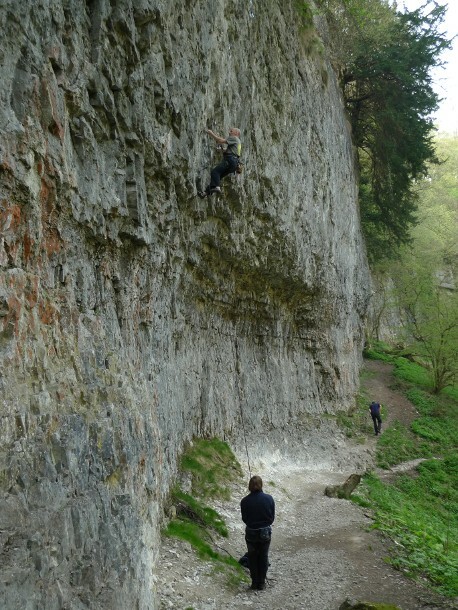 A climber was scaling what looked like an impossible wall of rock, it would have been impressive to watch him climb the overhanging section. The only thing to spoil my day was the occasional rudeness of the families that I passed. The path was often only wide enough for one person to walk at a time and I frequently would stop to let a caravan of people pass. It makes me quietly simmer inside when you stand there letting 5 or 6 people pass and not one of them says thank you. 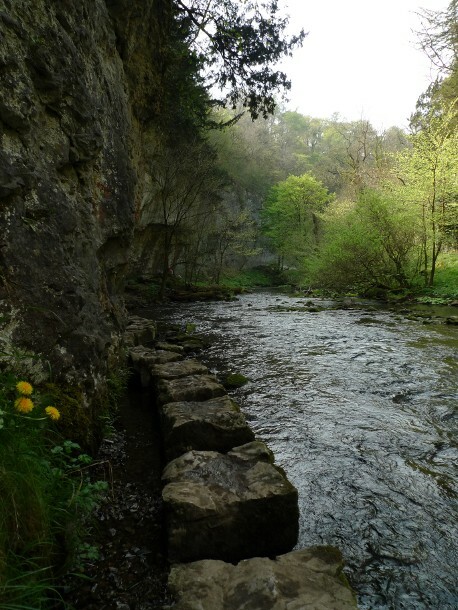 Suddenly there is not enough room for both the river and a path so huge stepping-stones have been laid at the foot of cliffs. After heavy rain the path is often impossible to cross, the stones being submerged. This time the river was in a languid mood and passage was easy. All too soon Chee Dale came to an end but I was still following the same river. With a change of name to Wye Dale there was also a change in my surroundings. 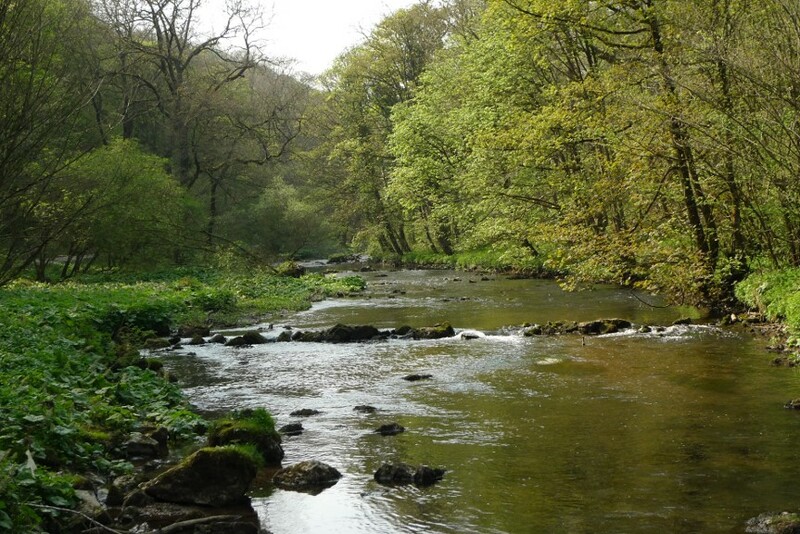 A much gentler landscape, the river calmer and in less of a hurry. 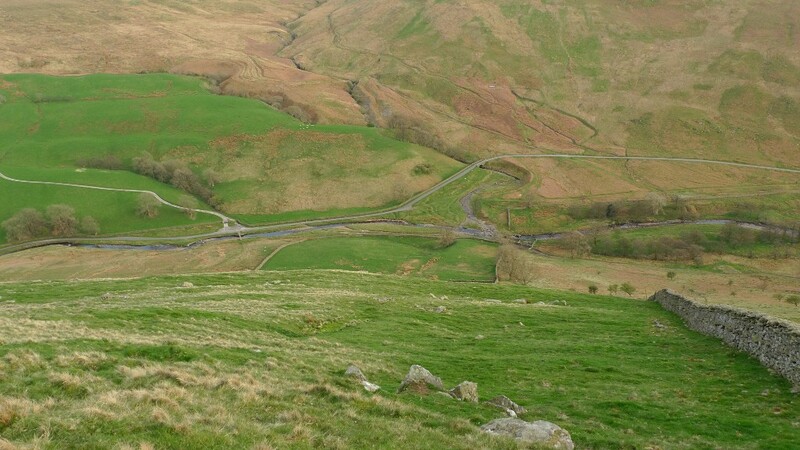 It is just a shame that the busy A6 high above the dale spoils the peace with the roar of traffic. 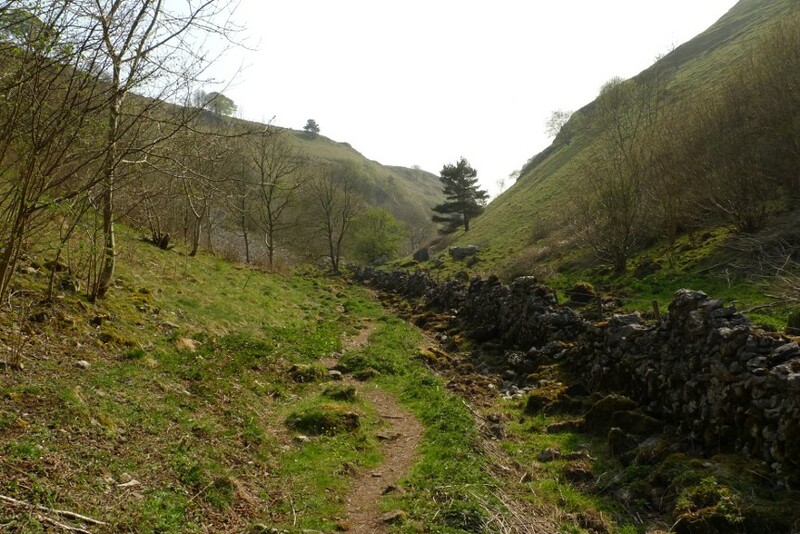 The riverside path soon spat me out alongside the busy road and I crossed over into the entrance of Topley Pike quarry. The start of Deep Dale is frankly a bit of a mess as you follow the edge of the quarry hidden to the right. Signs warn you that the quarry is not a playground and that you may sink to your death in quicksand. 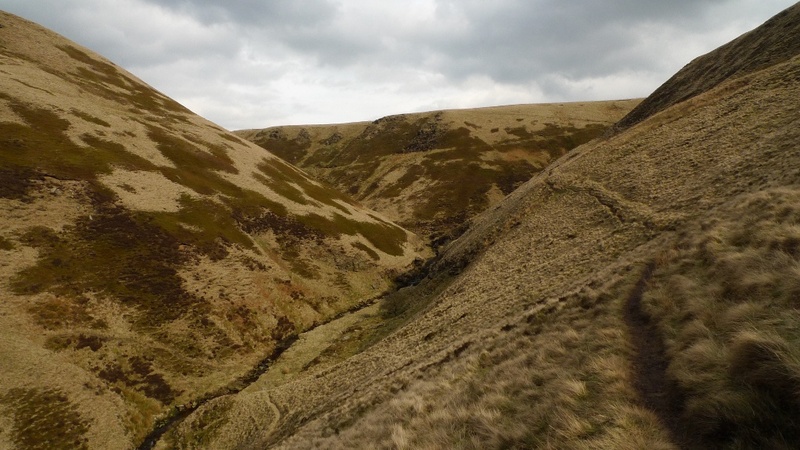 However a short sharp ascent and descent brings you into the dale proper and an oasis of peace and quiet. The narrow often rocky path gives the impression that this dale is not as popular as those close by. All too soon I was climbing the narrow right of way as it twists and turns up towards the lip of the dale and back onto the plateau. 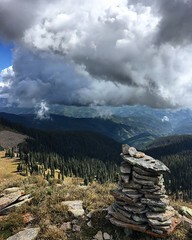 The views down were reward enough for the exertion that it brought to my legs. Approaching Chelmorton by fields and finally a track the rounded shape of Chelmorton Low came into view. Someone had gone to a lot of effort in arranging rocks on its slopes to write ENGLAND in huge letters, just about visible in the photo below. I was hot by the time I reached the Bongo and was keen to drink the extra bottle of water I had left in the van. The van itself was like an oven and the water undrinkable after sitting in the sun all day. I dreamt of ice-cold refreshment all the way home. 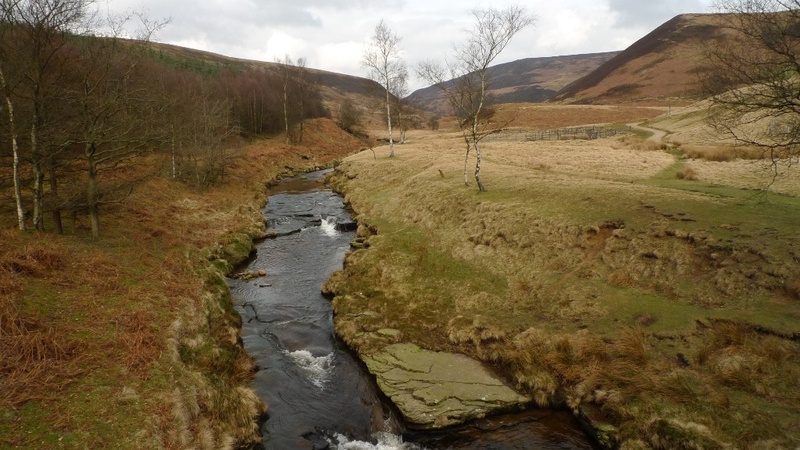 There is something special about the drive up the Upper Derwent valley. 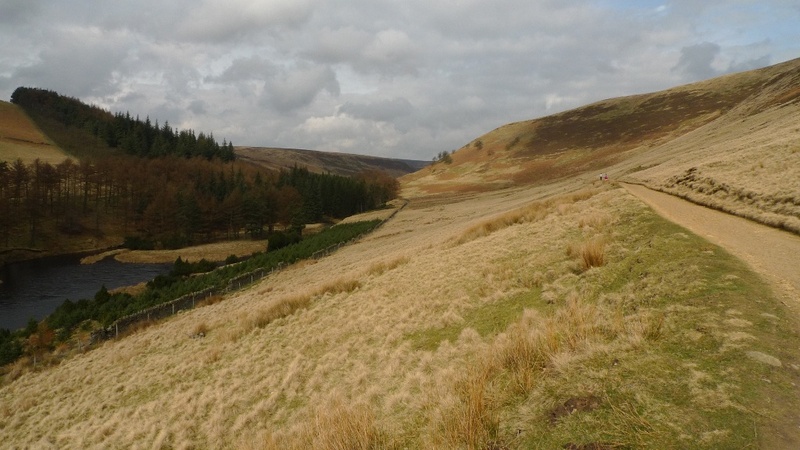 You leave the busy Snake Pass behind and head towards the popular Fairholmes visitor centre along the shores of Ladybower. This is about as far as most people go and usually at weekends the road that eventually leads to the turning circle at Kings Tree is closed to Traffic. 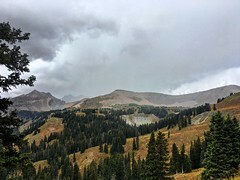 A great idea as it means that the upper valley is safe and quiet for those that want to cycle, a cheap frequent bus service shuttles up and down the valley for hikers who want to reach the remoter stretches. 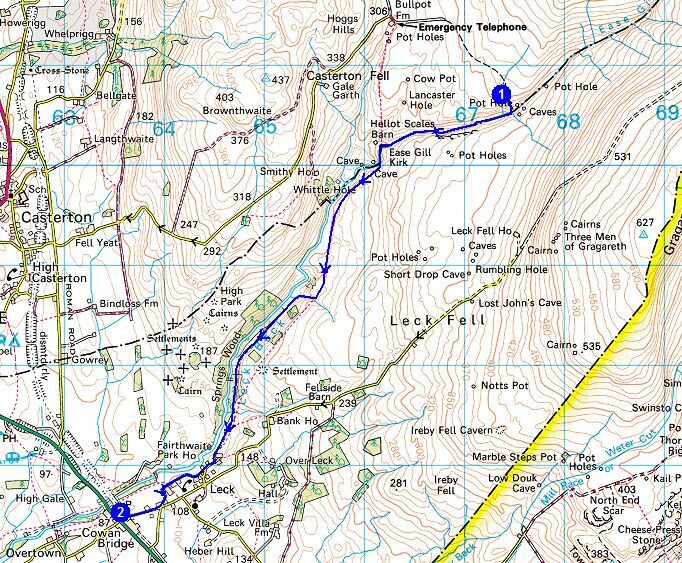 However on the day I did this walk it was a Saturday in March and the road was open. Leaving Fairholmes it often feels to me that you are leaving the Peak District behind and entering another much wilder world. 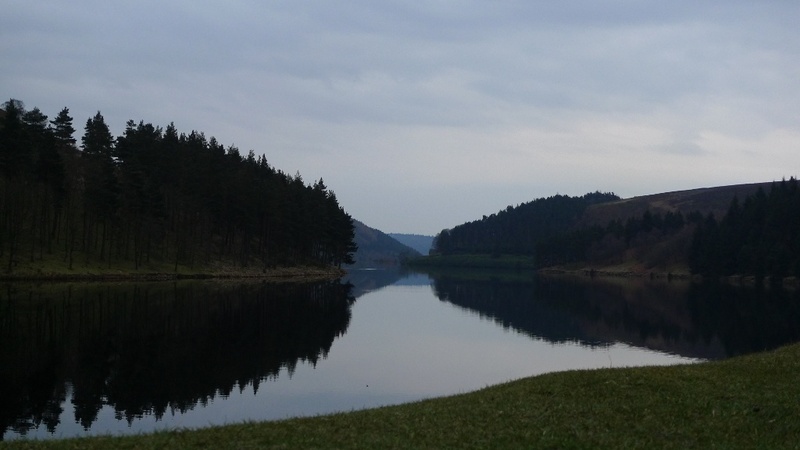 The narrow road that twists and turns along Derwent and Howden reservoirs takes me in my mind to Mid Wales. I passed no other vehicle on the few miles and there was only one other at the head of the valley where I left the van behind and set off into the wildest part of the Peaks. 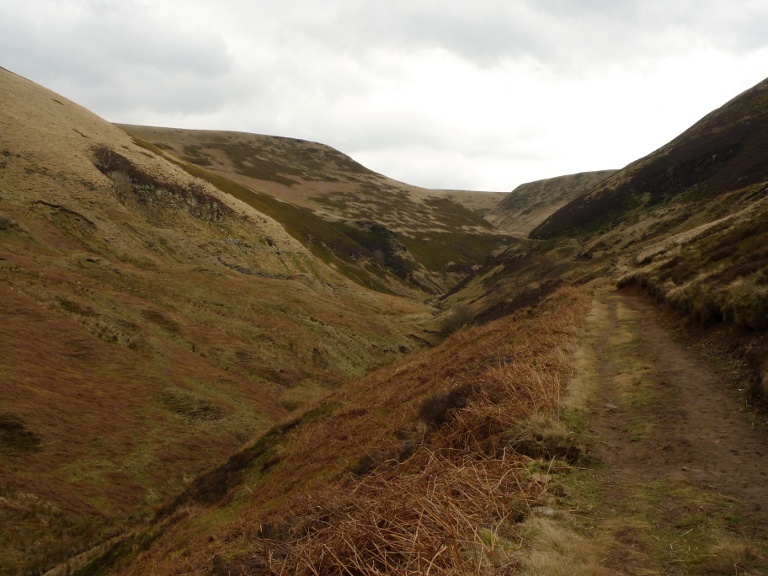 The walk up the broad track to Slippery Stones is one that I have done many time before and one that I never tire of. I can feel that I am getting further into the folds of the surrounding heathery heights. A popular spot for picnicking in the summer but deserted on this visit. 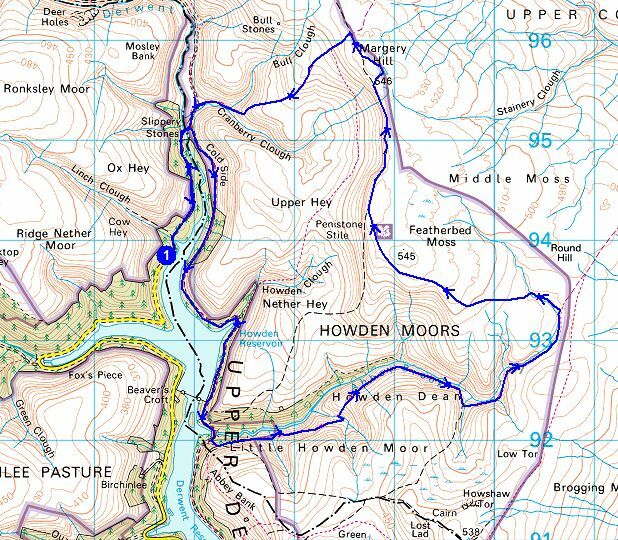 Instead of delving deeper into the hills Reuben and I turned south and headed back to Fairholmes but this time on the track that skirts the east of Howden Reservoir. The plan was to head to one of my favourite little valleys, or cloughs as they are known in this part of the world. The retrospective views back up the way we had come looked lovely in the early spring Sunshine. 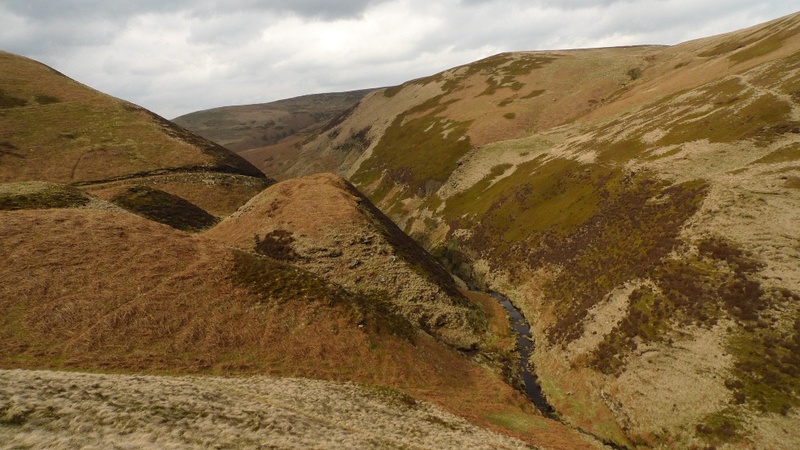 Abbey Brook is Dark Peak perfection, a steep valley which twists and turns its way onto the plateau. These steep-sided cloughs are the best way to get onto the hills and it is always a joy to enter their hidden depths. Abbey brook starts off tree-lined and a good track climbs high above the valley giving good easy progress. The trees are soon left behind and much wilder country is entered. The main track soon heads up towards Back Tor on the horizon and this is where most hikers also continue on to. However a narrow path continues towards the head of the dale and it was along this that myself and Reuben put boot and paw. A lofty perch was chosen for lunch, steep slopes falling to the river below. There was one moment of excitement when Reuben started to roll about on his back. He went the wrong way and slid a few metres head first with his paws in the air. It was so much fun that he repeated the same action a couple of times. 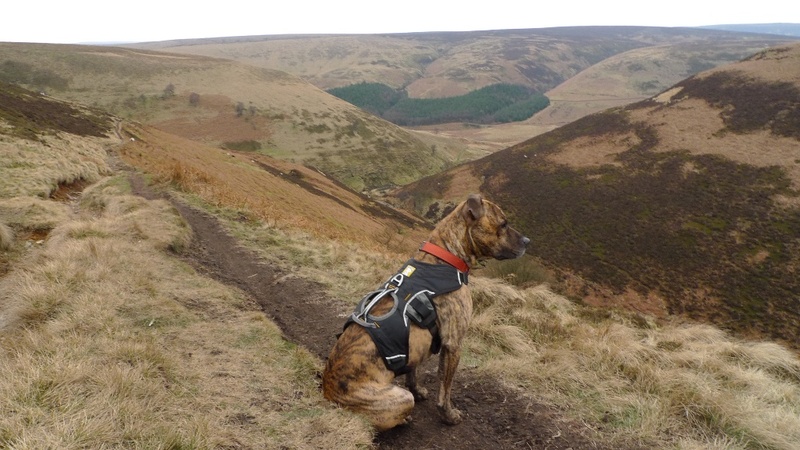 Luckily he had an extendable lead connected to his harness, just in case gravity took full control! Towards the head of the valley the contours gather ever closer together, tributaries needing to be crossed and map carefully checked to ensure the correct one is finally chosen to lead into the heart of the plateau. 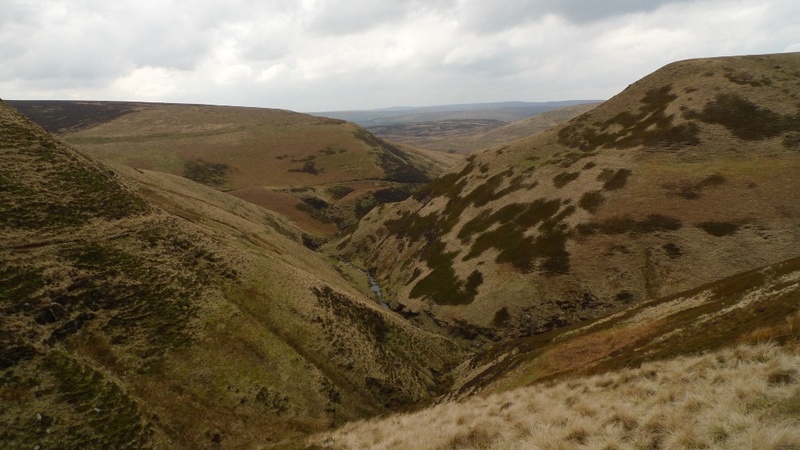 Reaching the moorland after the deep cloughs can be a bit of an anti-climax, today being no different as the now infant stream snaked its indirect way towards Featherbed Moss. Being in a wide boggy bowl the views were restricted so we headed across featureless ground until the edge was reached at Wet Stones. 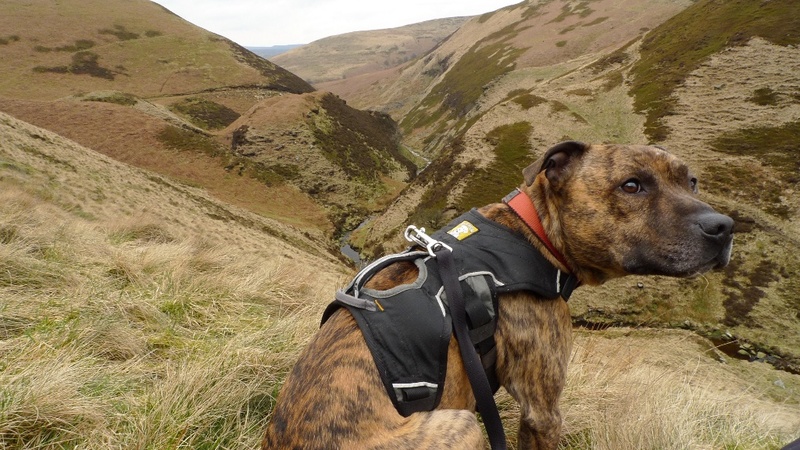 There were no sheep or anyone around so Reuben was trusted off lead, I know that dogs cannot smile but the expression on his face said it all. He happily raced up and down, nose pressed into the ground in full on hoover mode. 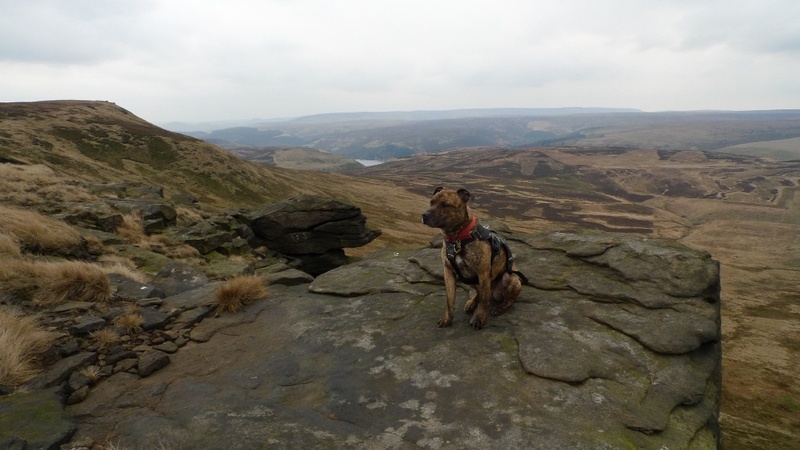 He had just enough time to model for the camera on the outcrops of High stones. There was one moment of embarrassment when he suddenly spotted a couple of hikers a few hundred metres away coming over the horizon. He was suddenly off at a great pace of knots to give them some love, totally ignoring my calls to come back. He has a typical terrier trait of not being able to run and use his ears at the same time. I set off at a trot behind him ready to offer my apologies to the couple who he was inflicting his canine love onto. Luckily they thought it funny that he approached them with such gusto, jumping up and covering them with licks. The guy commenting that Reuben appeared to be enjoying the hills. He is now booked on dog training classes at the end of June to try to teach him better recal and manners. I am not sure that other people would be so happy to see a large staffy type hound bound towards them at great speed considering the bad press they receive. After sharing his love he was kept at a firm heel, getting called back whenever he got more than a couple of metres away. It was hard work but worth it when we successfully passed a few sheep. His attention was kept focused on me and I was really proud that he showed no interest in the funny looking fluffy things. The trig on Margery hill was briefly patted and we then made our way down the bridleway of Cut Gate into Cranberry Clough and then back to the van via Slippery Stones. The Bongo was a solitary vehicle at the road head when I returned. Down on the valley bottom the air was completely still and there was not even a ripple on the surface of the reservoir. Night was fast approaching and on evenings like this I often regret not having gear with me that would allow an overnight stay in the hills. Driving back along the reservoirs I passed the Howden dam. With the water like a mirror and the reservoir full to the top of the dam, I got the illusion of a giant infinity pool. The glassy surface of the reservoir simply ended in mid-air. Magical. With the TGO challenge fast approaching and my fitness levels stalled at around the zero mark it was time to head outdoors with a pack on my back. The knee which gave me grief on the Isle of Rum is slowly getting less painful so I planned to spend one of the days recreating an average challenge day, i.e 14 to 15 miles with a thousand metres of ascent. It was also a good opportunity to visit a part of the Dales which I have not been to for a while, a part which for some reason does not feel the feet of many walkers. I like it that way. I left the van in the car park of the village hall in Cowan bridge and set off up the road towards Ireby though a pleasant pastoral landscape. Spring had truly sprung and the fields were full of lambs of varying sizes. I had to hold a trio back when I opened a gate to enter their field they were so eager for attention. They were obviously orphans and they followed me as I crossed to the other gate whilst some geese barked their disapproval. I finally ended up on the dead-end lane out of Masongill, heading towards the open hills with almost a purposeful stride. This was spoilt by a bench situated close to where the tarmac ran out. I think that it is rude to pass by a bench without testing its general load bearing capabilities. I therefore sat down for a while. A rough stoney track called the Turbary road continued on from the lane and I steadily gained height to the 400 metre contour. The views to the south had really opened up with the Forest of Bowland dominating the horizon, its moors stretching for miles. 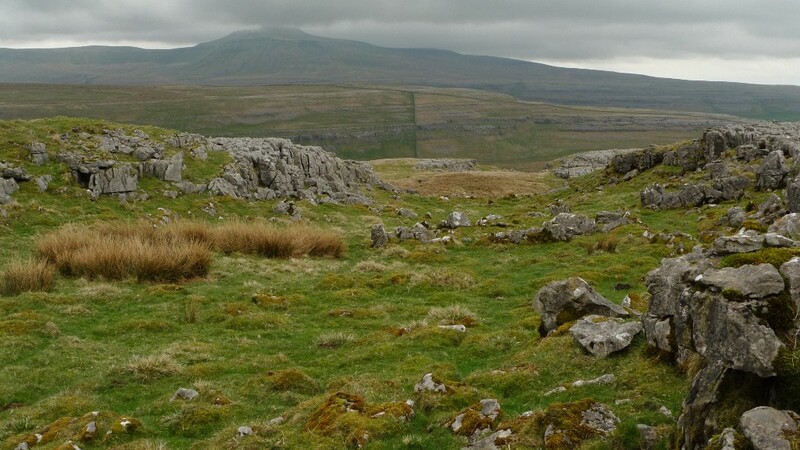 Leaving the track for a while towards Keld Head Scar the views towards Ingleborough opened up. 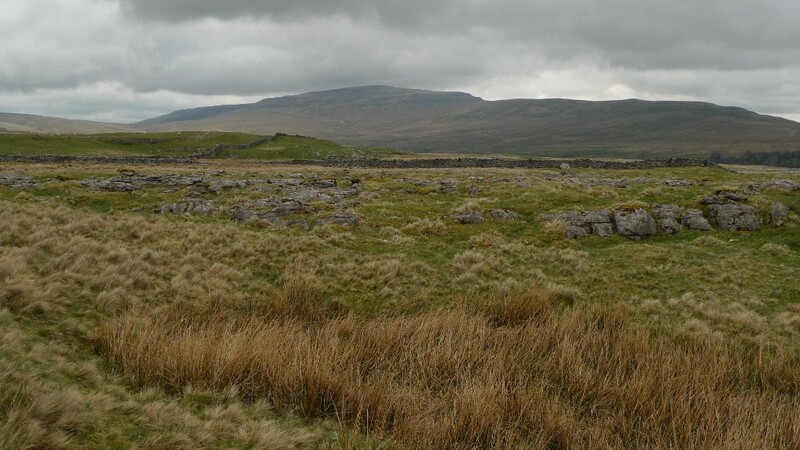 It was a view dominated by limestone with the lower flanks of Whernside looking like they were attached to Ingleborough. 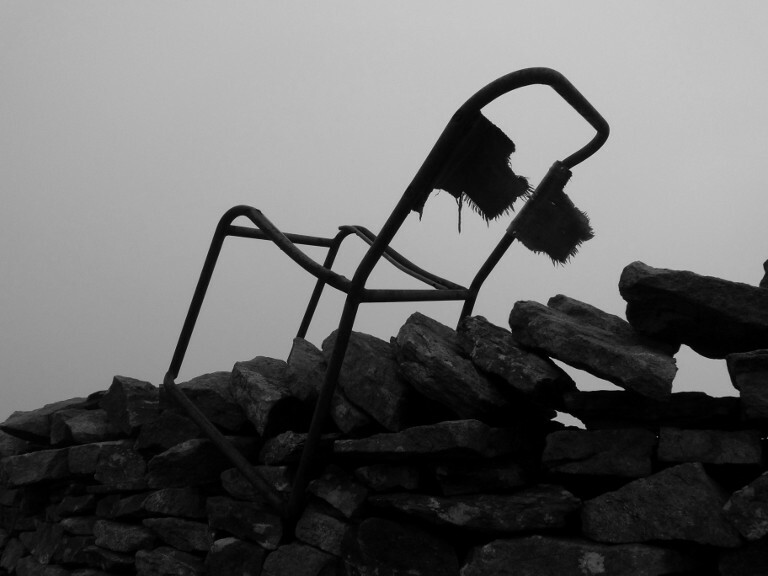 Whernside itself had finally lost its cap of cloud but it was still a grey scene, with a feeling that rain could be imminent at any moment. The Turbary road provides a great mid level promenade where distance is gained with ease and my mind slipped into the rhythm of walking. 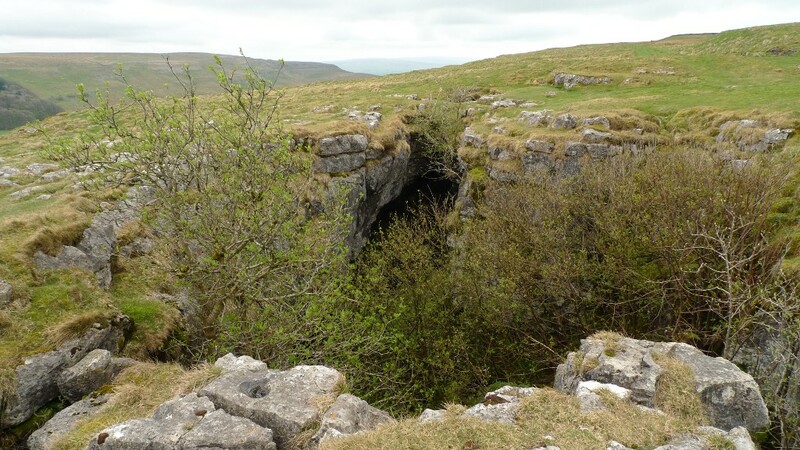 My non thoughts were suddenly disturbed by the sound of water running underground as I passed the impressive entrance to Rowten pot. Now this is the sort of place which makes my stomach do funny things. I have the fear but at the same time I am compelled to look over the edge. 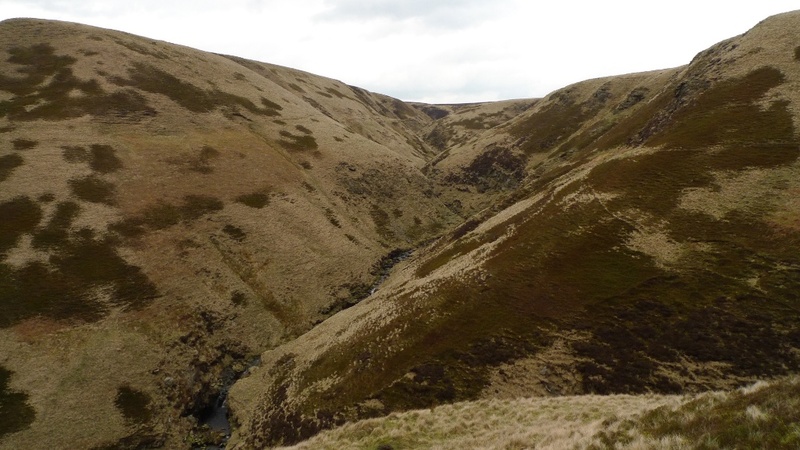 It is an impressive gash in the hillside with a huge drop down to running water below. I spent a while trying to get a good look into its depths, unfortunately impossible to photograph without the risk of falling in. 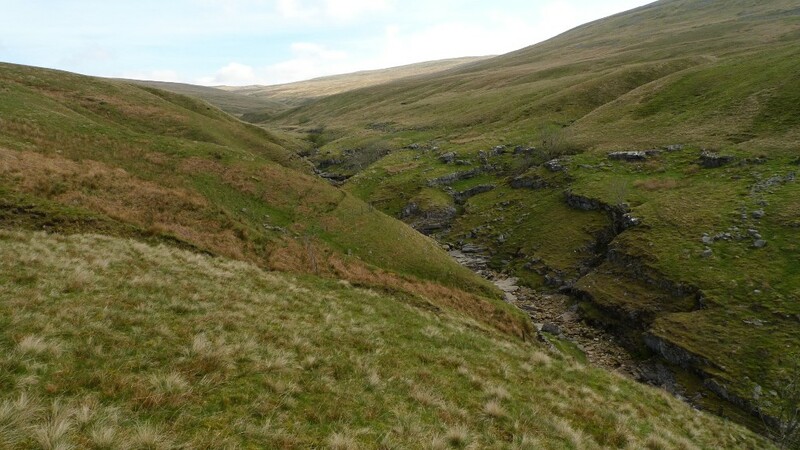 Soon after Rowten Pot the track turned towards the hills and I left it to descent to the road that runs through Kingsdale, a lovely unfrequented valley. 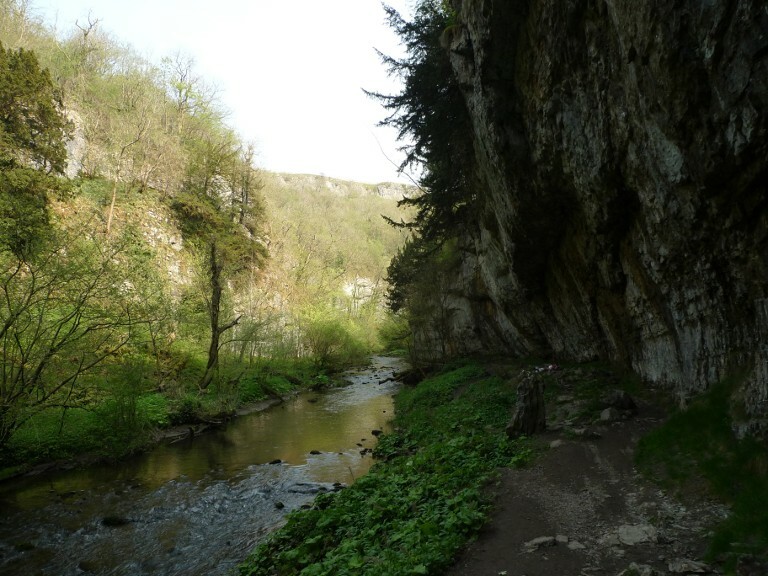 I had lost the height that I had gained over a few miles so that I could visit Yordas cave which I have read is both accessible and spectacular. I am glad that I did, a huge chamber leads through to an underground waterfall at the far end tumbling from unseen heights. 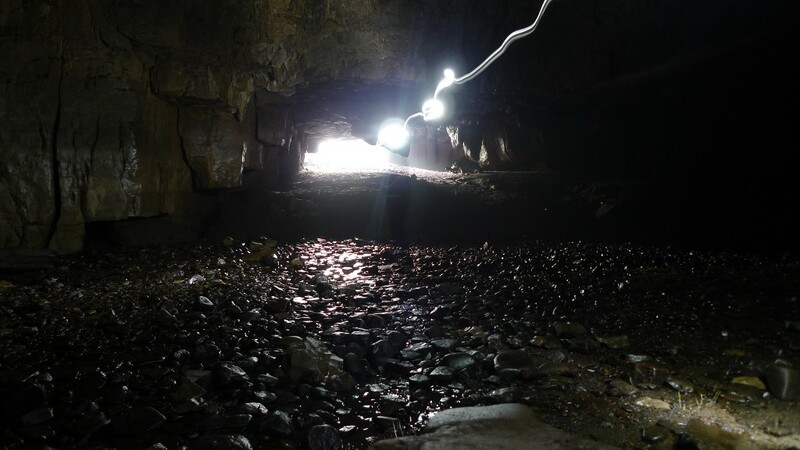 Unfortunately the air was too full of spray and mist to take a photo of the waterfall, but I did manage to get a few shots within the cave using my Gorillapod. 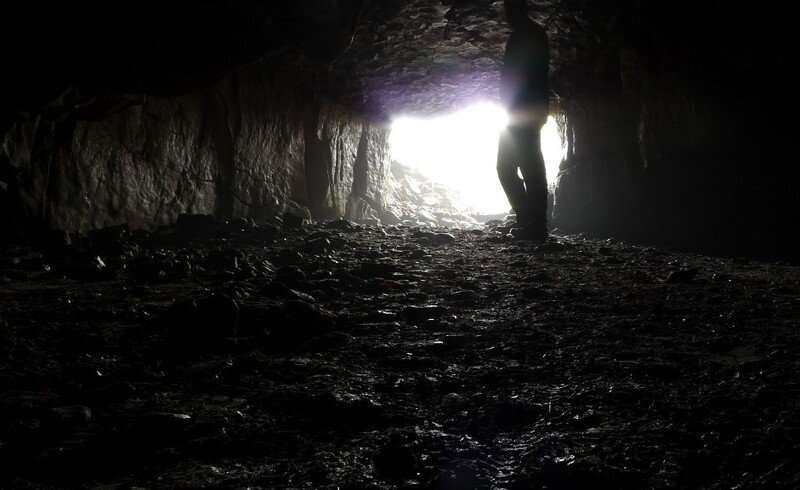 After an enjoyable half hour exploring I shouldered my pack once more and exited, climbing steep slopes alongside the woods that fringe the cave system. 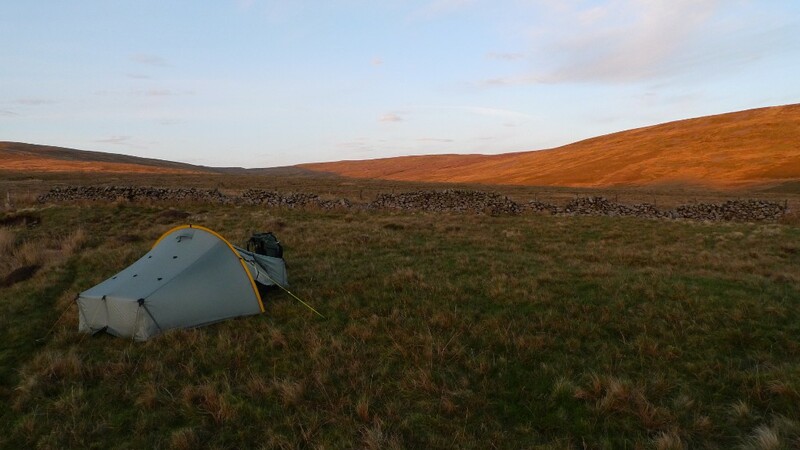 It was getting late and just below the moorland intake walls I found a nice little spot to set the tent up on, a fast flowing stream nearby. The cloud started to lower on the surrounding hills but with the sun trying to fight through. 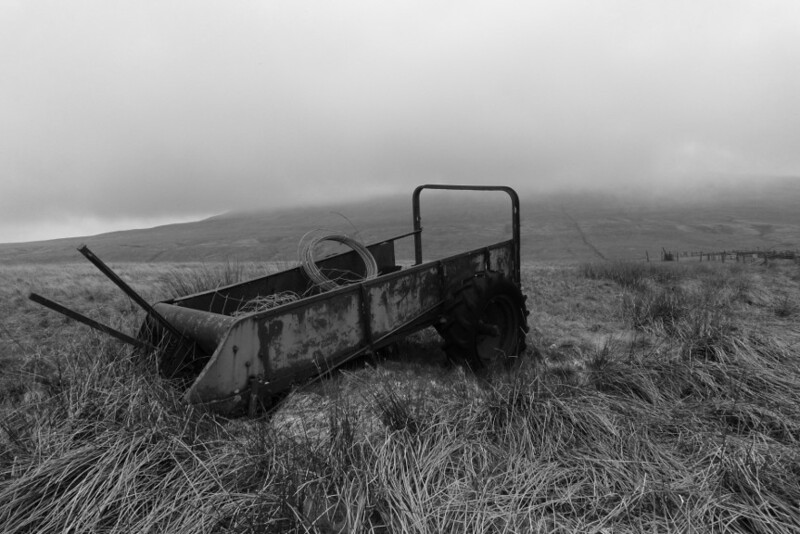 There was one dramatic moment when the distant Ingleborough summit rose above the surrounding clouds making it look much more the mountain than it really is. Unfortunately impossible to photograph without a huge zoom. Whilst packing up the following morning I noticed a figure with dogs climb a distant drystone wall and start heading my way. As they got closer I noticed that they were dressed in a rather ‘tweedy’ manner and were carrying a shotgun. I got a shift on with my packing just in case I was about to get a telling off for camping on the moors. Emerging from my tent I was relieved to see that they had passed a couple of hundred metres away and were heading downhill. Potential confrontation averted! All packed I started the climb towards the summit of Gragareth, initially heading for the enclosure of Turbary pasture. 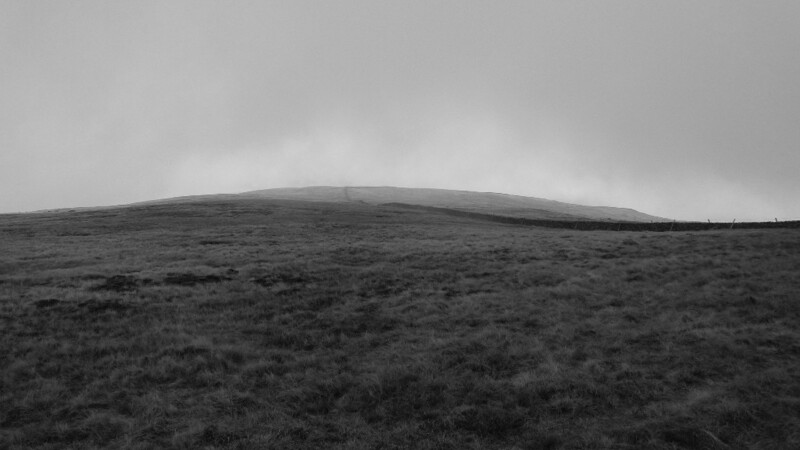 I soon entered the low cloud so popped on some music for the steep climb alongside the wall. The summit itself was nothing special with no views so I turned and followed the drystone wall along the ridge towards Great Coum. I spent a while pondering if the old chair found resting on the wall was a bit of abstract art, if not how and why did it end up there? 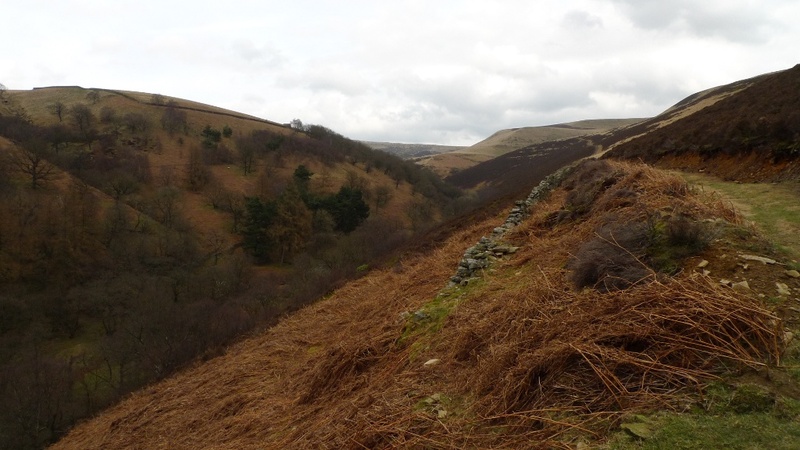 The ridge was a trudge with no views and it appeared that I had picked the boggiest side of the wall to walk on, the other side often looked temptingly dry, a case of the grass being greener and all that? Leaving the ridge and descending to the north there was a brief moment when the mist cleared for a few seconds, a chance for a very bleak photo. 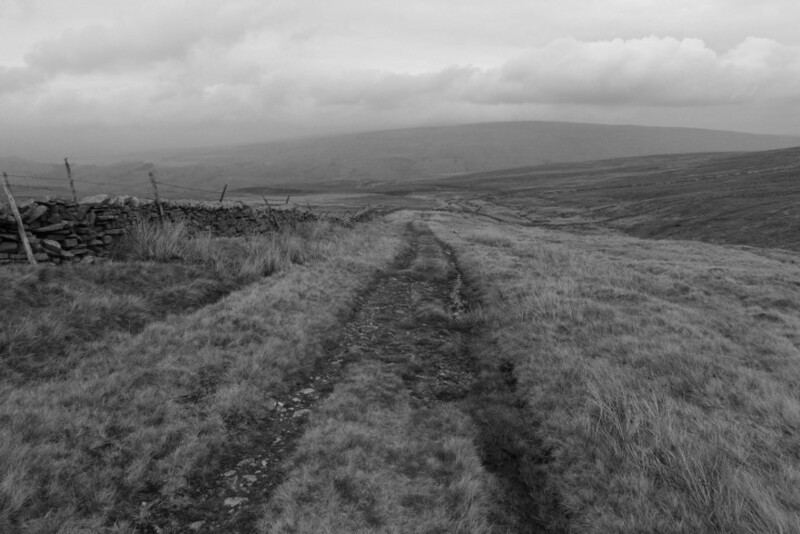 I used a drystone wall as a secure handrail to follow across the featureless moors meaning my compass could remain in my pack. 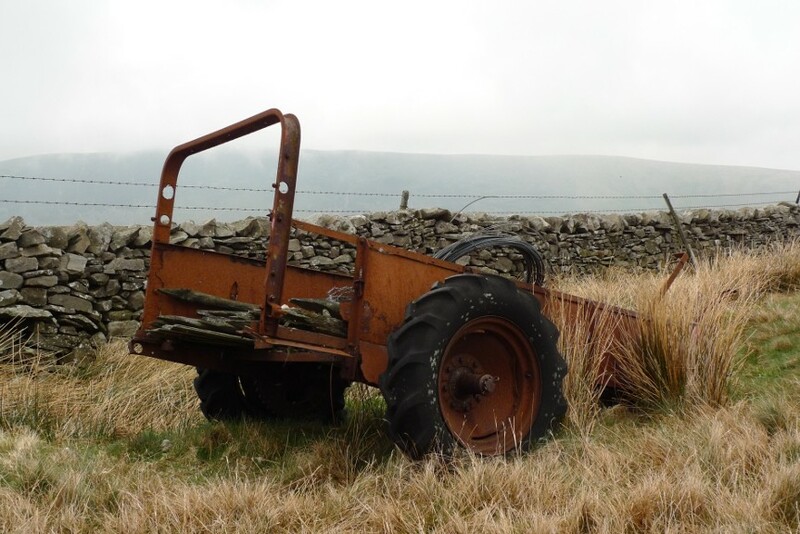 A rusty old trailer providing a brief diversion. Thankfully I soon picked up a well-worn track which is not marked on the map and this took me quickly and easily down to the green lane and the head of the Barbondale road. 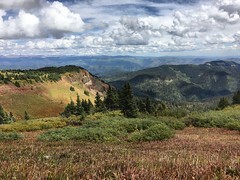 The long summit ridge of Calf Top was directly ahead of me, its slopes looking impossibly steep, a direct ascent being very unpleasant. 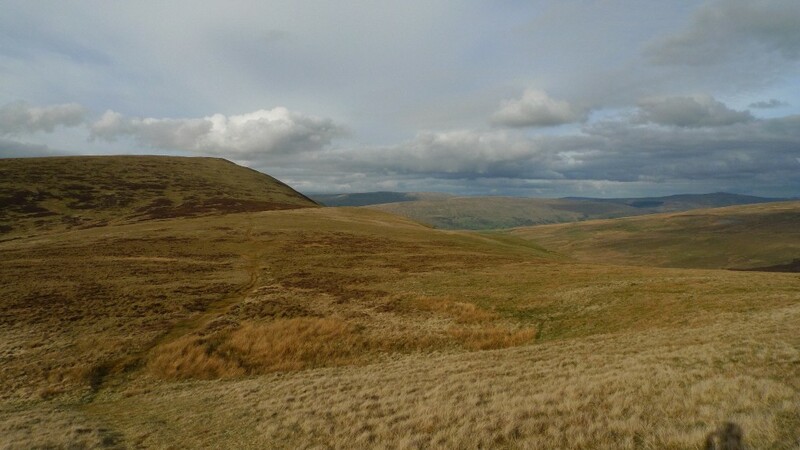 It closely resembles the Howgill fells on the other side of Dentdale. Being separate from the surrounding hills it has alway escaped my attention, because of its isolation I now had a punishing climb ahead of me. 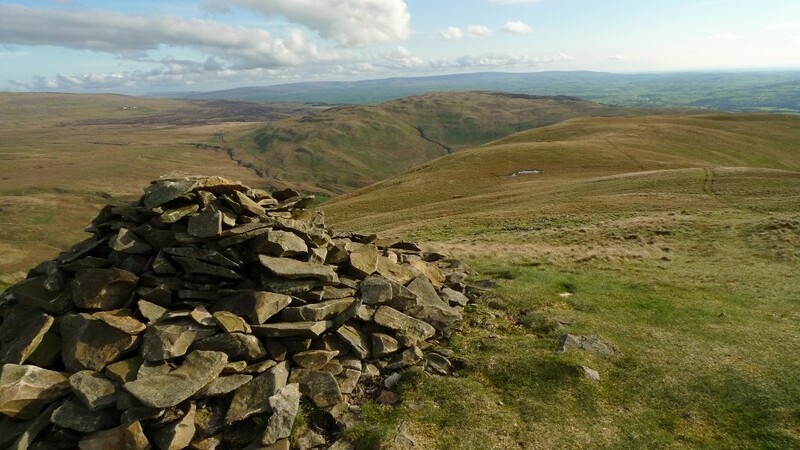 I took a contouring line to reach a cairn above the steep Combe scar and was rewarded with great views up to the head of Dentdale and across to Great Coum from which I had descended. The wall along the summit ridge took me easily to the trig point where I suddenly felt the need to remove my socks and footwear as my heels felt like they were on fire. Looking blister free I continued (after putting footwear back on) but was very aware that my Adidas Terrex were rubbing my heels making walking uncomfortable. The narrow secure heel cup was gripping my wet socks leaving my foot to move within the sock itself causing a bit of friction. Continuing along the ridge to Castle Knott the sun finally came out and visibility improved putting more of a spring in my step. 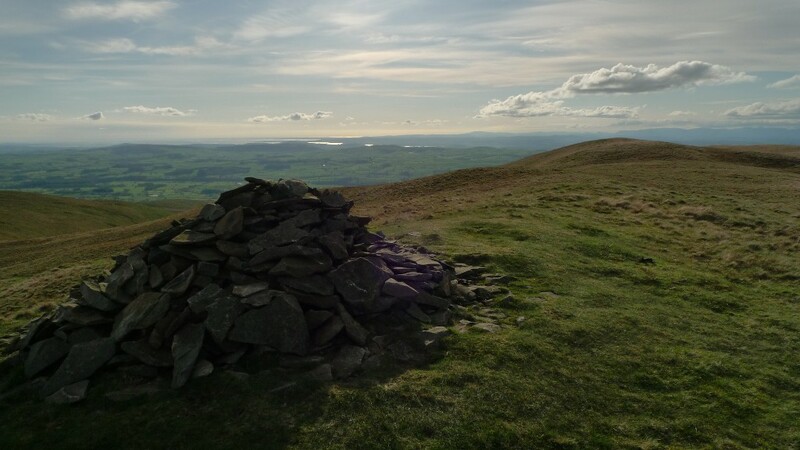 The summit of Castle Knott itself is a great place to soak up the views which extend all the way to Morecambe bay. 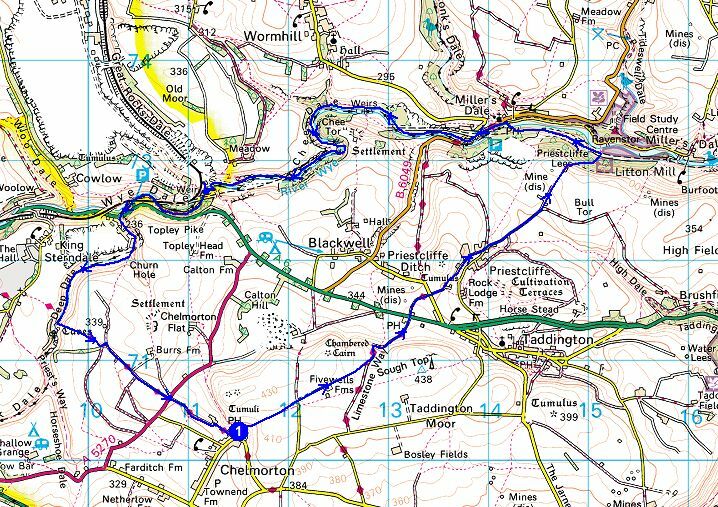 I then wished that I had studied the map a bit closer, taking into account the close contours before plunging headlong towards Blindbeck bridge. It all started off ok but the grass slopes simply got steeper and steeper, I gingerly walked down with my knees screaming at me. Thankfully the close-cropped grass was dry as a slip in the wet would probably be fatal, a quick way to get to the bottom. A final sting in the tail came further down when the slope became convex and even steeper. Much cursing and slow and careful foot placements finally got me safe and sound at the bottom. The area around the bridge is about a beautiful spot as it is possible to get and it looked like a lot of people agree by camping next to the river and leaving a bit of a mess. I looked at the way I had descended and shuddered, turned my back and walked the bridleway to Bullpot farm. It was obviously party night at this caving club hut, with music blaring and groups standing around enjoy a beer in the evening sunshine. A few friendly hello’s and I passed on by following a track and then a path down towards Ease Gill. 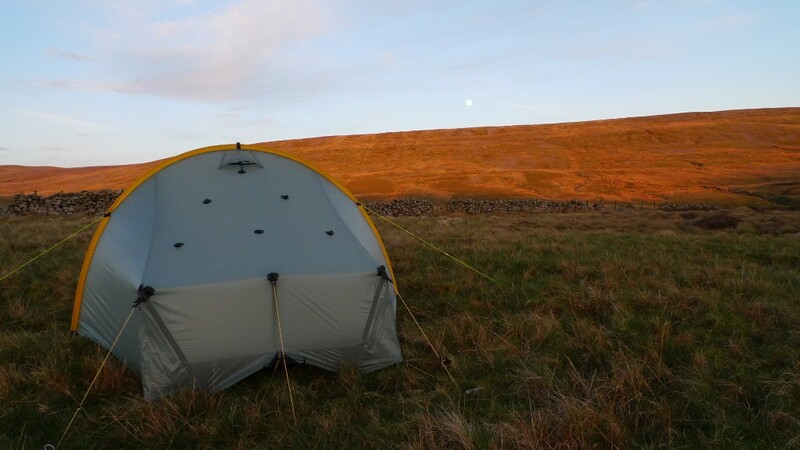 A flat spot was found and the tent erected just as the sun set in a ball of fire over one hill, whilst the moon rose from behind another. I realised that I was in full view of Leck Fell house across the valley but it was about a mile away so surely no one would come and ask me to move. It really was a lovely spot and I was surrounded by birdsong, the call of the curlew being most dominant. For the first time this year I heard Snipe drumming, surely the most evocative moorland sound? After dinner I thought that I would lay-down for a few moments before reading my book…………………. 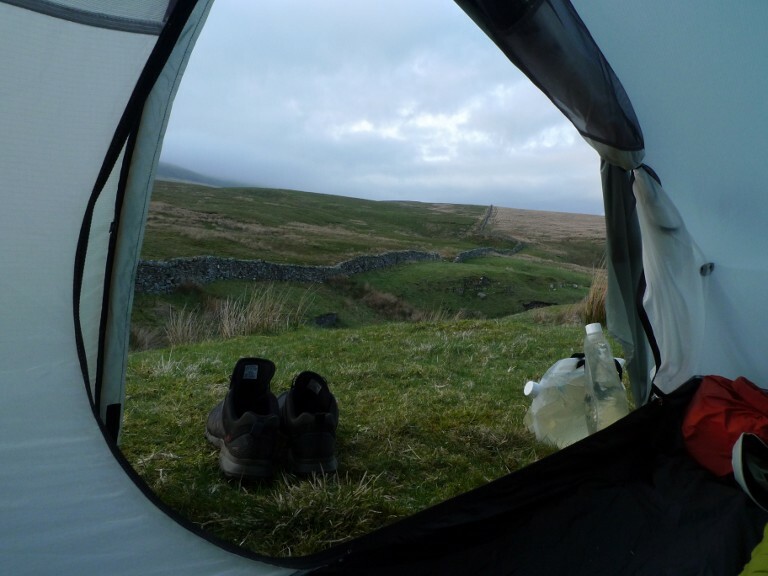 I awoke with the moon casting a glow through my tent and looked at my watch, it was 2.30am. A few moments had lasted a few hours and the tent was still open. There was a slight frost on the grass as I zipped up and tidied away my cooking gear. 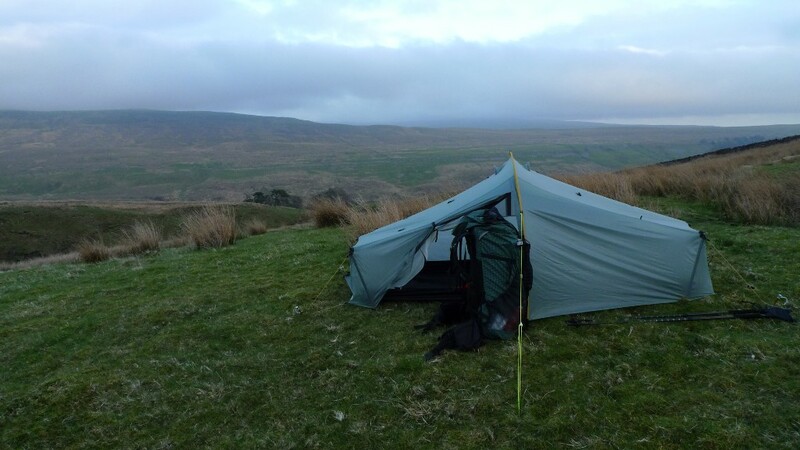 The still windless night meant that everything was coated in condensation and my sleeping bag was slightly damp. However it did not take long to drift off to sleep again. The warmth of the sun woke me up in the morning and the birds were celebrating the new day with vigor, it is great to wake up on a sunny spring morning on the moors. 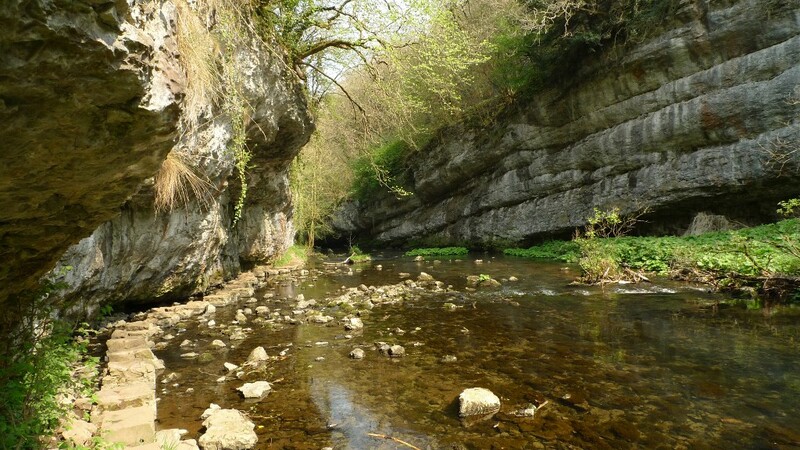 Tent packed and legs and feet aching from the previous day I walked down to the dry Leck beck, the water often disappears down into the extensive cave system. 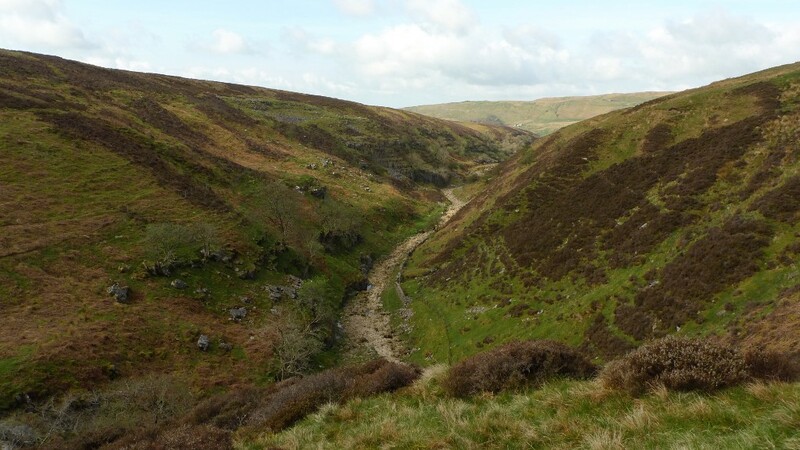 I thought that it would be fun trying to follow the river bed downstream rather than remain on the moors. 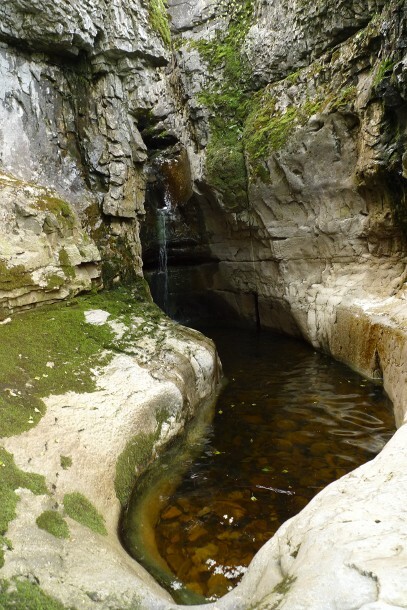 Descending into the hidden depths I found a lovely limestone gorge with a trickle of water running into a deep pool, in hot weather a perfect spot for a dip. 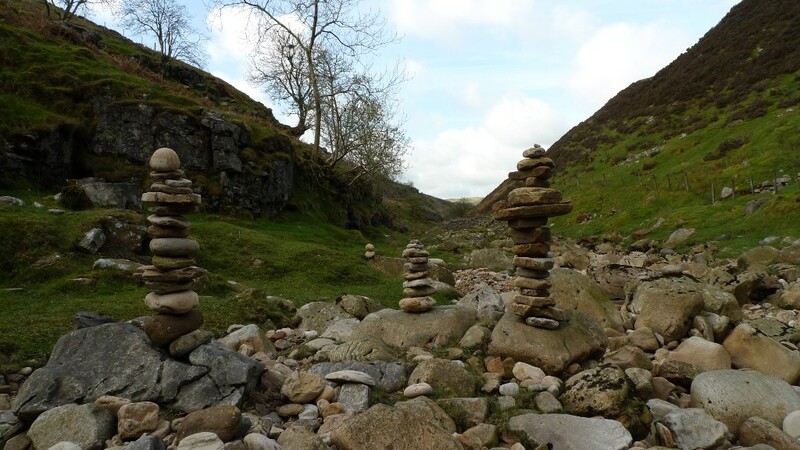 Previous visitors had elected to fill the dry river bed with some artfully crafted slender cairns. It was easy following the dry river bed, hopping from one bank to another until I came to another dry waterfall hidden deep in another gorge. It was like entering a lost world down there. 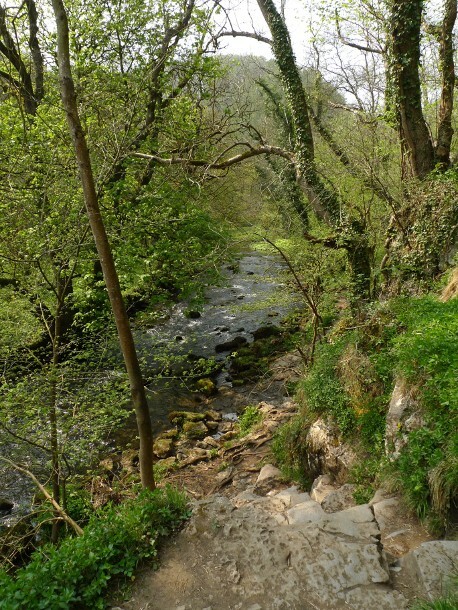 A footpath followed the river all the way down to the hamlet of Leck and it was an idyllic walk in warm sunshine with only sheep and lambs for company. By the time I reached the van it was hot and I was glad to get my pack off and visit the village shop for a cold drink and sandwich. 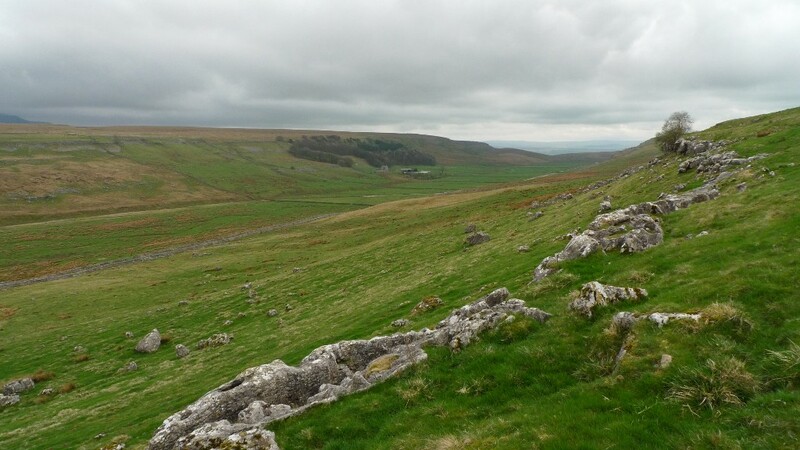 A splendid walk though Dales scenery without hardly seeing another hiker. Driving home along the A65 it was evident that everyone was heading somewhere else. 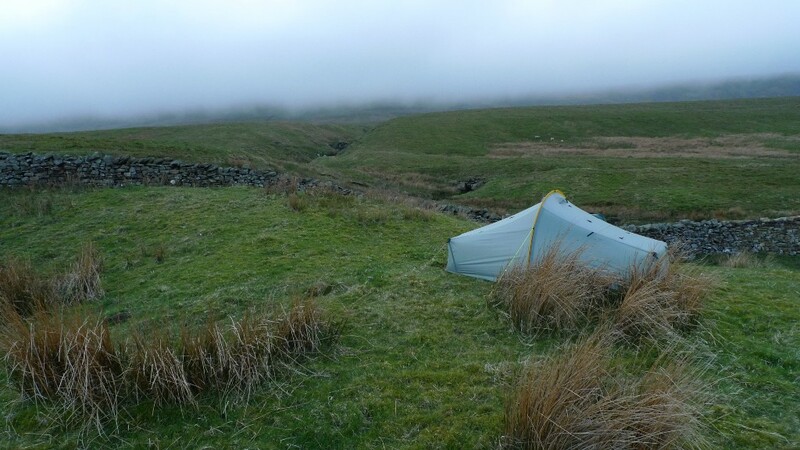 All being well I am off tomorrow for a quick backpacking jaunt to the Yorkshire Dales. It has suddenly occurred to me that the TGO challenge is now less than a month away and I am a rather unfit and unhealthy backpacker! My knee has slowly been improving since the trip to Rum and I want to test it out over a few miles with a pack on my back. 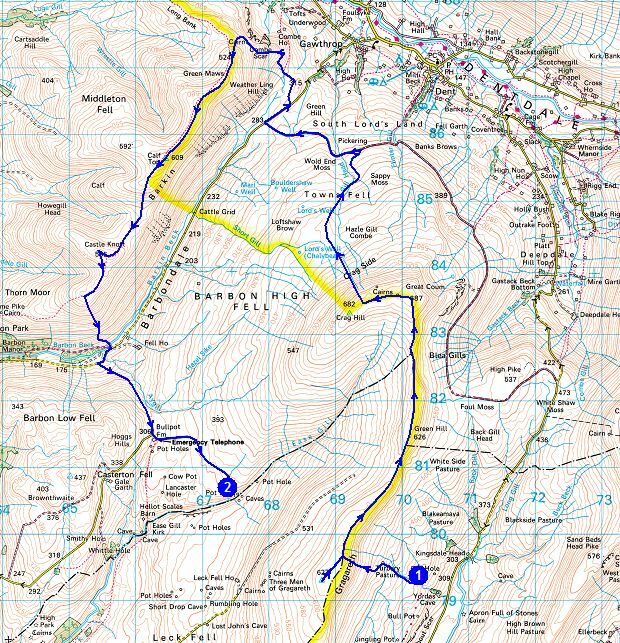 A short 7 or 8 miles tomorrow after the journey up to get the body working again. On Saturday I have got a 14 to 15 mile day planned, the average length of my challenge days. I need to get used to that sort of distance pretty quickly. Sunday is my birthday and not wanting to be billy no mates on the day I will just do a few miles so I can get home for some pampering (Corrina if you are reading this?). Anyway the spare room is a chaos of strewn about gear (just discovered my down slippers have gone mouldy after Rum) and the dog is eager for his walk. Have a good weekend folks, hope that you manage to hit the hills yourselves.